Nissan's worldwide revenue decreased 8.4 percent to $25.84 billion in the latest quarter, as global sales dipped 0.6 percent to 1.29 million vehicles. Nissan now says it will be unable to reach CEO Carlos Ghosn's goal of an 8% global operating profit margin by March 31, 2017. Here are some milestones. July 2016: Company says 8% will not happen this fiscal year. EDITOR'S NOTE: This story has been corrected to note that Nissan halted sales of Mitsubishi-built minicars after faulty fuel economy ratings, not emissions tests. YOKOHAMA, Japan -- With currency changes cutting into its earnings, Nissan Motor Co. is backing away from CEO Carlos Ghosn's bold goal of an 8 percent operating profit margin by next March. Profits are also being undercut by falling sales in the home market, triggered by a stop-sale of minicars involved in an emissions-testing scandal, the automaker said last week with the release of its quarterly earnings, and by rising incentives in the United States to move passenger vehicles such as the Versa and Altima sedans. Corporate Vice President Joji Tagawa said last week that Nissan also is withdrawing its much publicized goal of reaching an 8 percent global market share by the end of this fiscal year, March 31, 2017. "In this fiscal year, we are not thinking of achieving it." Tagawa said. Ghosn has made statements in the past year to acknowledge that his 8 percent market share goal might take longer to achieve. But he indicated no flexibility on his 8 percent operating profit objective. As recently as last autumn, he warned that heads could roll if the Japanese carmaker misses his operating profit margin target. "Eight percent operating margin is a commitment. This is a clean-houser," Ghosn said at the time, referring to a need to broom staff if the company falls short. Nissan is getting close -- operating margin expanded to 7.2 percent in the latest quarter, from 7.0 percent a year earlier. But the pace of improvement will make it difficult to deliver Ghosn's goals, the automaker has conceded. Tagawa said the appreciation of the Japanese yen is slowing Nissan's march to the goal, contained in Ghosn's so-called Power 88 midterm business plan. "Through the fiscal year, it may be difficult to attain 8 percent," Tagawa said on Wednesday, July 27, while announcing fiscal first-quarter earnings results. Ghosn announced the Power 88 midterm goals in June 2011. 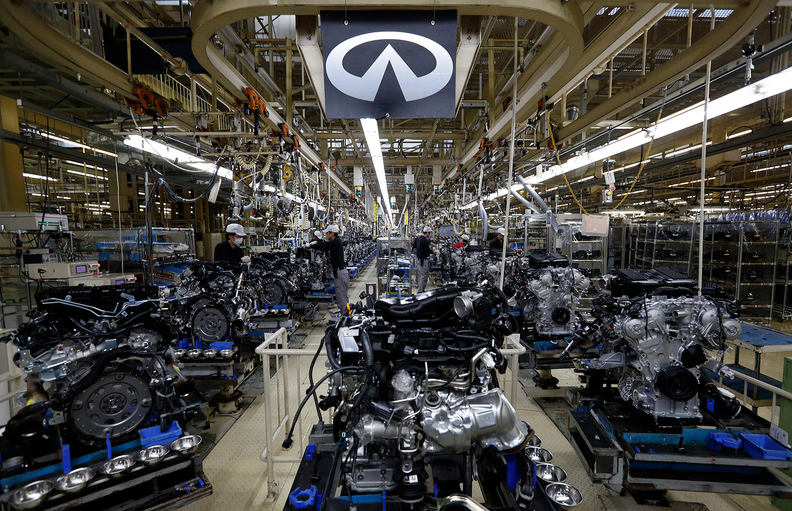 A worsening foreign exchange equation is expected to wreak havoc on Japanese automakers' bottom lines this earnings season. Nissan's operating profit slid 9.2 percent to ¥175.83 billion, or $1.71 billion, in the April-June quarter, while net income fell 11 percent to $1.33 billion. Worldwide revenue decreased 8.4 percent to $25.84 billion in the quarter, as global sales dipped 0.6 percent to 1.29 million vehicles. Excluding foreign exchange losses, Nissan would have posted a 3.2 percent increase in revenue and a 38 percent surge in operating profit for the quarter, Tagawa said. "Our business, per se, is not in a problematic situation," he clarified. But unfavorable exchange rates lopped $889.1 million out of Nissan's operating profit. Falling sales volume in Japan, where Nissan suspended sales of minicars supplied by Mitsubishi Motors Corp. due to faulty fuel economy ratings, also hurt performance in the quarter. Even North America, Nissan's biggest market and traditional cash cow, failed to deliver big gains. Regional operating profit was also hit by swinging foreign exchange rates, especially the yen's appreciation against the Mexican peso and Canadian dollar. The yen surged 11 percent in value against the U.S. dollar in the just-ended fiscal first quarter, compared with a year earlier. Even as North American vehicle sales climbed 8.9 percent to 529,000 units for the quarter, regional operating profit fell 17 percent to $774.1 million for the period. Higher U.S. incentive spending on passenger cars such as the Versa and Altima also hurt. Nissan's lineup is more car-heavy than many competitors, Tagawa said. Those models require more cash on the hood, Tagawa said. "The sales competition is very fierce."